At the start of the day Bosworth had a relegation threat hanging over them. Victory for Oakham over Long Buckby could have seen Bosworth go down if they failed to pick up any points. A win or at least a losing bonus point or a try scoring bonus point were required to be certain of remaining in this league. 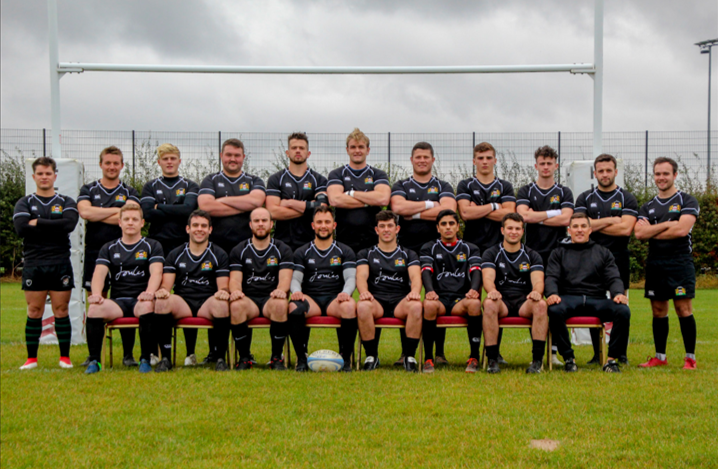 Market Harborough started strongly building pressure through a mixture of strong forward carries and great handling from the backs which resulted in the first try coming after just 2 minutes from Centre Milkha Basra. Laurence Joel duly converted and the visitors were up 7-0. It was then Bosworth’s turn to put some phases together. Using strong forward runners who benefitted from some really poor tackling from Harborough around the fringes they powered over for a try of their own. After barely 10 minutes the game was already 7-5 in Harborough’s favour. The tackling from Harborough remained too high which allowed Bosworth to make a few extra yards in the contact area. Timmy Waterfield was doing his best to show his team mates how it’s done with some great chop tackles that stopped the big Bosworth forwards in their tracks. Harborough were awarded a penalty deep in opposition territory and opted for a scrum. Keeping it tight they threw everything at the Bosworth try line with several strong pick and drives, Lee Butler ultimately getting over the line for a try. Another Joel conversion made it 14-5 to Harborough. Bosworth were once again allowed to come back in to the game through a Harborough error which gifted the home side a penalty in Harborough’s half. From the penalty Bosworth put together several good phases of play and scored to take it to 14-10. At this stage Harborough were making too many basic errors and were paying the price by gifting the home possession and the chances they needed to keep in contention. Geordan Stout was doing his best to keep momentum going for Harborough with some fine running in field from his wing. His strength and power were making him hard to bring down and was unlucky to be tackled just short of the line after one great run. A long clearance kick from Bosworth was taken on the full by Harborough fullback Harvey Slade who weaved through the chasing defence to release Milkha for his second try of the game. It was a fantastic counter attack try that was once again converted by Laurence Joel. The lead was now 21-10. The second half kicked off with Harborough now attacking down the slope with the wind. It was Bosworth who started the more strongly though. Once again building several phases but unable to just go the extra phase or two required to break down the defence. Unforced mistakes and handling errors kept letting Harborough off the hook. In contrast, when Harborough created chances of generated pressure they capitalised on them. The next try pretty much summed up the game for both teams. Bosworth were attacking well and were in the Harborough 22. Poor hands saw the ball dropped and was quickly gathered up by Laurence Joel who had Bosworth forwards ahead of him and a line of Harborough backs alongside. Sprinting over half the pitch he fixed a defender and had 3 supporting runners to choose from. His pass found Milkha who raced away to score his third of the day. A perfectly executed run away try that came directly from a Bosworth error which reflects the difference between the two teams on the day. Alex Adams had replaced Jack Digby and Tim Brown took to the field to earn his First XV tie with his 25th appearance. Fantastic to see him reach this milestone after the commitment he shows to the club week in and week out. Dan Rycroft came off the bench to step in at 10 for Carl Strickson. Soon after the Harborough backs attacked wide straight from a scrum and Harvey Slade scored in the corner. The conditions were perfect for Harborough’s backs to stretch the opposition defence and they duly obliged with some great handling and lines of running. 2 more tries from Harborough were to follow. One from Chris Bale who had made several strong carries and line breaks during the game. This time he popped up on Milkha’s shoulder after he had made a great break. The off load to Bale saw him race in under the posts for his 18th try of the season. The conversion extended the lead to 38-10. Harborough’s final try came from a driving maul from an attacking lineout in Bosworth’s 22. Sam Blades literally thrown over the line by his team mate to score a try to take the score to 45 for the visitors. Bosworth weren’t finished though. With 5 minutes left they were determined to get a try scoring bonus point so that they could be sure of league survival. Strong, determined carries deep in to Harborough’s half saw Bosworth get the tries they needed to secure a point. The final score 45-20 to Harborough. 8 wins on the trot is a great way to end the regular season and all the focus is now on the play-off on 27th April against Dronfield. It will be a tough game and a massive day for the club. Whatever happens I think all those who watch the first team regularly would agree that it has been another great season. Going one better than last year by securing second place, despite losing some key players at the end of last year, is a credit to the players and coaches. The togetherness and spirit in the squad is special. Please come down to support and help give the lads the boost that could help get them the victory that will see them in to Midlands 1 East.